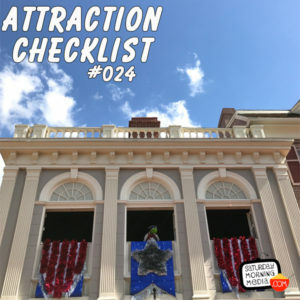 http://www.attractionchecklist.com – The Muppets have invaded Liberty Square in Magic Kingdom and are bringing there irreverent brand of comedy with them! In this episode we listen to the two versions of The Muppets Presents…Great Moments In American History: The Midnight Ride of Paul Revere and The Signing of the Declaration of Independence. Recorded on October 26, 2016. This episode we head to Magic Kingdom at Walt Disney World for The Muppets Present…Great Moments In American History. Located in the Liberty Square section of the park, The Muppets do retellings of famous moments from American History in the windows above Liberty Square’s Heritage House and The Hall of Presidents. Because this is a show there are no age or height restrictions to view it. Before we get an education in American History from Sam The Eagle, here are five fast facts about The Muppets Presents…Great Moments in American History. 1. The show debuted at the Magic Kingdom on October 2, 2016. Great Moments in History features two alternating famous historical retellings. The retelling of the Declaration of independence features the human character of Liberty Square’s Town Crier, James Jefferson or JJ for short, who solicits interactions from the crowd gathered to watch the show. The other show centers around the Midnight Ride of Paul Revere and stars the Muppets on their own. 2. The show began development in 2014 after the release of Muppets Most Wanted. Originally the show was just going to feature Sam The Eagle on his own but it was decided that the show would be more fun if the other Muppet characters were added in. 3. Because the bulk of Muppets’ performance takes place in the second story windows of Liberty Square’s Heritage House, the Muppets puppets are built 5% bigger than they normally would be for film and television in order to be properly seen by audiences watching from below. 4. Longtime Muppet script writer, Jim Lewis, was brought in to polish the scripts for the show to make sure they fit with the classic Muppet sensibility. 5. Though they are not doing the puppeteering themselves, the voices of the Muppets are provided by longtime Muppet performers Steve Whitmire as Kermit, Eric Jacobson as Sam The Eagle, Miss Piggy and Fozzie Bear and Dave Goelz as Gonzo. Now let’s head to Liberty Square to hear The Muppets retelling of two great moment of american history, the Midnight Ride of Paul Revere and The Signing of the Declaration of independence. And be sure to Stay tuned afterwards to hear my thoughts on these shows. As always, this is a binaural recording so if you have headphones put them on now as we head to the Magic Kingdom for The Muppets Present…Great Moments in American History.